Tzvika Territory -שטח צביקה- is how autodidact sculptor Tzvi Bas called the patch of land in the entrance to Kibbutz Kefar Sald which he turned into a sculptures garden. His sculptures are made of old agriculture machinery and local basaleth stone and despite their naiveté, and also because of it, they acquire a memorial-like dimension, put in nowadays context. Tzvi is an old man now, too old to take care of the graden. He is moving around in a mobility scooter, aided by his philipino care-taker, a reality that symbolises everything that the kibbutz wasn't meant to be. We encountered the Zvika Territory, and later on Tzvi Bas himself, during the research and shooting of Same River Twice. 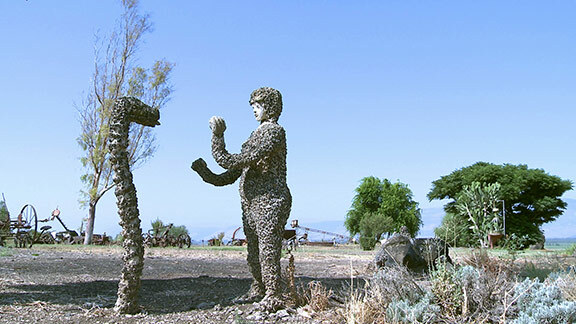 As the sculptures garden is located a bit off the riverbed of the Jordan, it didn't find a place in the film. But we still feel it merits to be seen and currently are working of making an independent piece of it.